Over the past 6 months I have been working on two projects with people with disabilities. It has been challenging, fun and rewarding. It puts progress and accomplishment in perspective. When working with people with disabilities an amazing break through may amount to someone holding a drum stick for 30 seconds, or staying awake for longer than 5 mins or choosing to be in the same room as the music rather than hiding in the next room. Working in these contexts makes it more obvious than ever that our expectations of outcomes have an enormous impact on our sense of accomplishment. Its a fine line balancing between asking enough? or too much? of ourselves or others. On one hand if we expect too little there is no room for growth or transformation … boredom and mediocrity will ensue. On the other, if we ask too much of ourselves or others we can end up feeling inadequate and/or constantly dissatisfied with where we find ourselves. hmmmm…… One of the things I have always loved about drum/performance/community projects is challenging peoples perceptions of what they are capable of. Having participants successfully perform at a festival or community event and excitedly tell me how amazed they are that they actually did it, is a great feeling. I have been thanked many times by previously dubious teachers or participants when they realise that they were indeed capable of what I was asking of them. At times encouraging people to exceed their own or others perception of what they are capable of can make people feel inadequate or uncomfortable but this in the end is an inescapable part of the process of learning anything. The ability to put ones self into situations which are new and challenging is the essence of learning, growing and transforming through out our lives….. It is one of the many conundrums of life. To excel at anything or indeed to progress in anyway requires a certain amount of feeling out of ones depth and at times feeling… unable, disabled or inadequate … in this way what we experience truly is all relative. I guess next time you are giving yourself a hard time about not being good enough at drumming, spare a thought for some of my drummers who are doing well on the days they can manage to hold a stick or get there hands to flatten out enough to hit a drum once….. 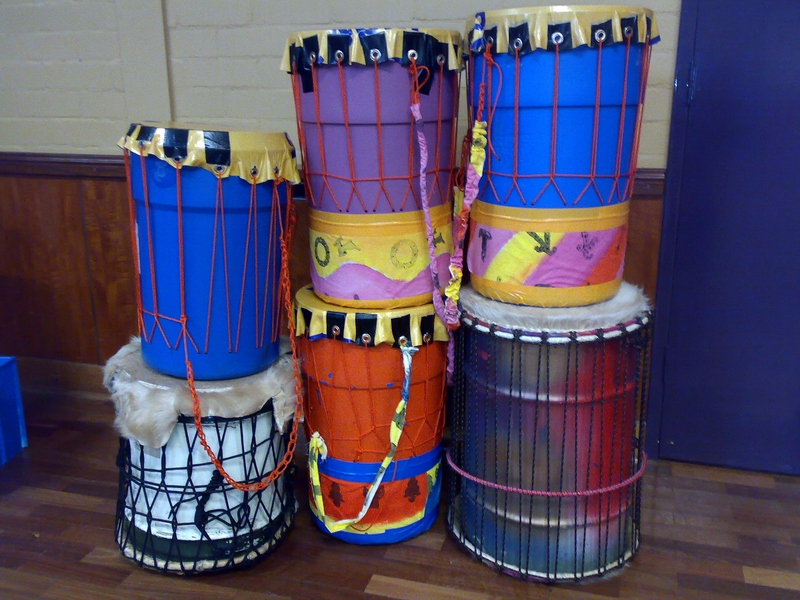 I logged in, not to write an essay about learning, but to post these photos of recycled drums which we made as part of one of the disability projects. I am really happy with the design. They were designed to be light, easy to transport have no sharp or dangerous bits and be generally difficult to break or hurt anyone with! 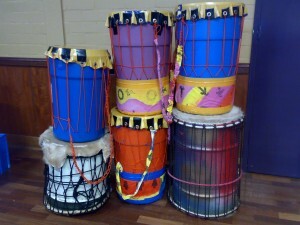 These requirements are useful in many community drum making projects. The plastic bins have holes drilled in the bottom and around the sides. 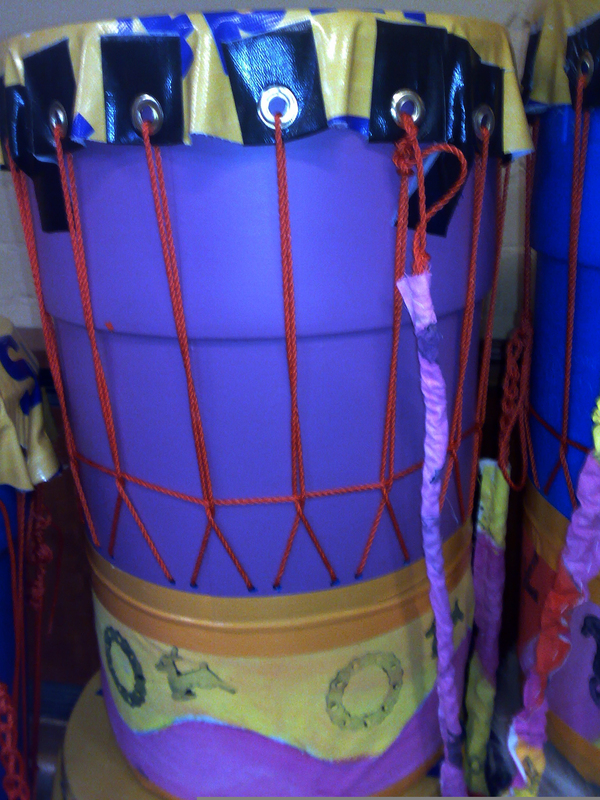 They are strung like a traditional African djembe. 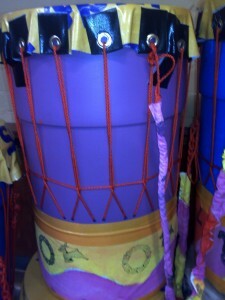 The skins are made out of banner material. All materials were sourced from Reverse Garbage in Marrickville except for the rope and the hole making set. The holes are reinforced with canvas and gaffer tape to stop tearing. 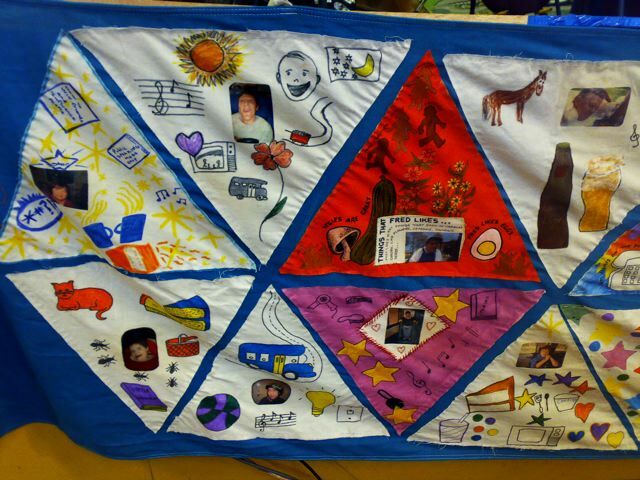 and here is a segment of the banner we made as part of the project. It is made up of triangles which represent what the clients favorite things are. 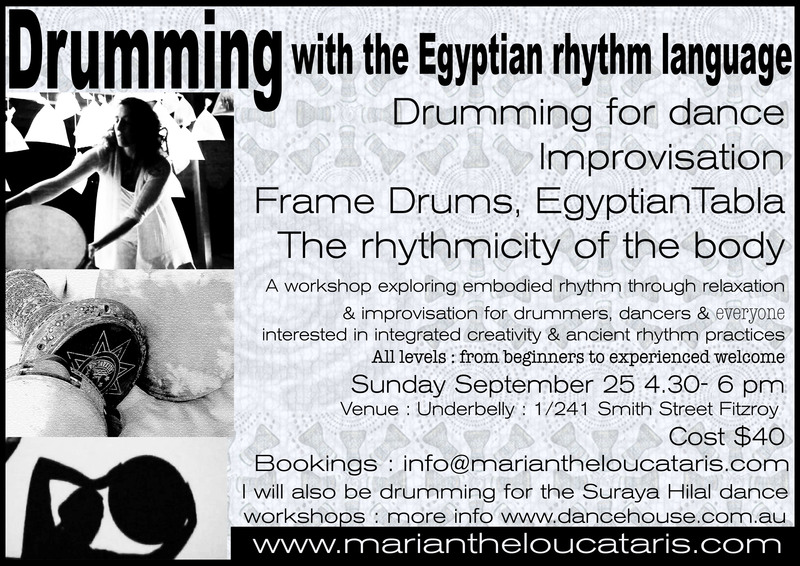 Suraya Hilal will be running 5 days of workshops in April and I will be drumming for her on the Sunday of the workshop. There are 2 , 3 and 5 day options for the workshop and everyone at all levels are welcome to attend. This will be the third year I have attended and i highly recommend her as a teacher and dance artist. Her bodywork methods are invaluable for performers of all backgrounds as well as anyone interested in an integrated approach to health and well being. Her particular combination of breathing, posture, stretches and movement concepts is the most delightful, gentle and effective way to stay balanced and strong. Her knowledge and choreographic responses to traditional Egyptian music is also priceless! MEN and women are welcome! 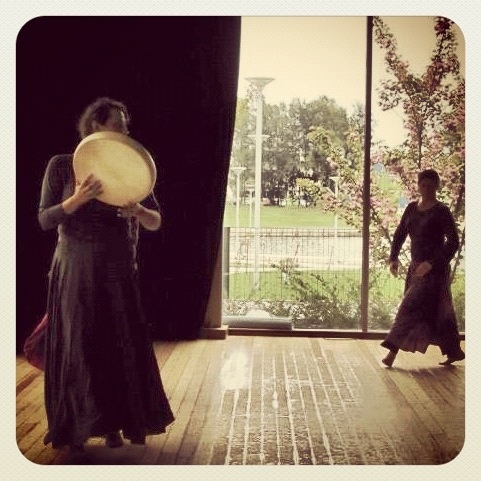 See links to Hilal Dance International on the right for more information on Hilal Dance. Click on pdf below for workshop flyer. Dancer Sarah Hamilton and I will be working on an evening of music and dance for later in the year. Pencil in the date and I’ll give you more information as it comes to hand.